As a general principle use a split programme of 5 kg/ha in broadacre crops and up to 10 kg/ha in high value crops 12 kg/ha in Top Fruit. AminoA Plus will stimulate many phases of the plants growth so target the applications at the growth stages that you believe to be key to the particular crop. Eg apply to crops of seed/salad/crisping potatoes at tuber initiation for more tubers but wait until tuber initiation has finished to apply in French fry varieties. 0.5 kg x 1 Autumn (With Insecticide late October /Early November before growth stops). 1.5 Kg x 1 (As soon as growth starts in the spring). 1.5kg x 1 (GS 30) By itself or in mixture with Fungicide/ trace elements ( Warning do not tank mix more than 0.5 kg ha with growth regulators or herbicides that work by disrupting amino-acid chain ( Granstar etc) and use only the lowest dose of growth regulator or herbicide in the mixture especially with short strawed varieties of Wheat). Higher doses should be applied minimum of 4 days before or after other treatments. 1 Kg x 1 (As soon as growth starts in the spring). 1kg x 1 (GS 30) By itself or in mixture with Fungicide/ trace elements ( Warning do not tank mix more than 0.5 kg ha with growth regulators or herbicides that work by disrupting amino-acid chain ( Granstar etc) and use only the lowest dose of growth regulator or herbicide in the mixture especially with short strawed varieties of Wheat). Higher doses should be applied minimum of 4 days before or after other treatments. 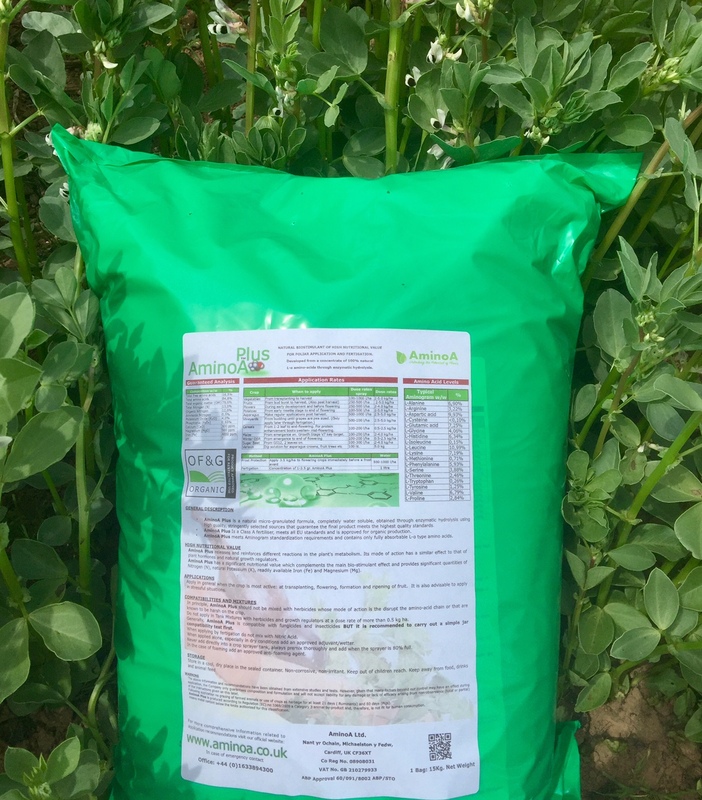 1kg x1 (GS 39) By itself or in mixture with Fungicide/ trace elements. 0.5 kg ha with every application to the crop. 0.5 kg x 1 After emergence with insecticide. 0.5 kg x 1 With Autumn Fungicide. 1kg x1 As soon as growth starts in Spring. 1.5 kg x 1 (stem extension with insecticide). 0.5kg with every pass through the crop. 2kg x 1 (stem extension with insecticide). 2.5kg x 1 (5 True Leaves aprox 14 days after emergence). 2.5kg x1 (Latest possible application 16 True Leaves or more). 1.5kg x 1 (5 True Leaves aprox 14 days after emergence). 1.5kg x1 (Latest possible application 16 True Leaves or more). 0.5 kg with every pass through the crop. 5 x 2 kg ha (total dose 10 Kg ha) timing aprox every two weeks starting with first fungicide before rows meet. 5 x 1 kg ha (total dose 5 Kg ha) timing aprox every two weeks starting with first fungicide before rows meet. 0.5 x 1 kg ha (total dose 2.5 Kg ha) timing aprox every two weeks starting with first fungicide before rows meet. 3.5 kg ha x 3 (First application aprox 60 days after sowing following applications at 21 day intervals). 2 kg ha x 3 (First application aprox 60 days after sowing following applications at 21 day intervals). 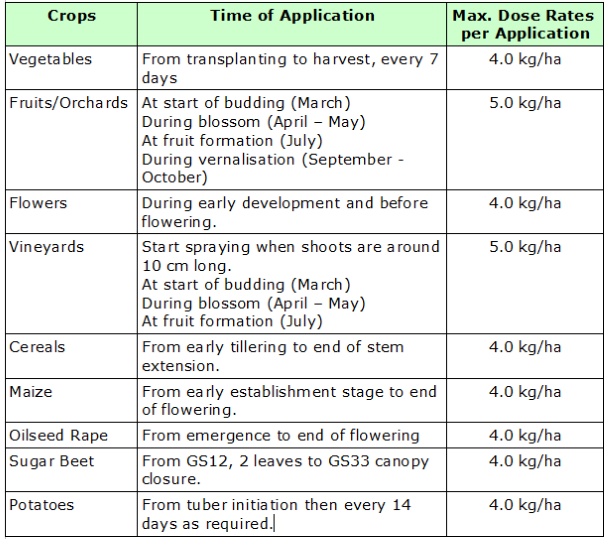 0.5kg ha x 3 (First application aprox 60 days after sowing following applications at 21 day intervals). New plantations from Crowns. Dip Crowns in AminoA Plus solution ( 5kg per 100 litres water) at planting. Subsequent management and Established Plantations. Apply to fern from June onwards every 3 weeks 2.5 kg ha up to 4 applications. August – September 2.5-3.5 kg/ha. Spring at first growth 2.5-3.5 kg/ha. Before flowering 2.3-3.5 kg/ha. ( NB in varieties that flower vigorously and unirrigated crops delay treatment until flowering has completed or you will have too many small fruits). Frost protection. Apply 3.5 kg/ha in 1000 litres water ha if possible on the evening before an expected frost. Apply 2.50 kg/ha from 3rd leaf stage every 15 days 3 to 5 applications. Dip plugs in solution prior to planting out 5 kg AminoA Plus /100 litres of water.